Lady Gaga arrives at the 2010 MTV Video Music Awards looking like royalty in an Alexander McQueen gown. Lady Gaga poses on the white carpet in Alexander McQueen at the 2010 MTV Video Music Awards. Lady Gaga poses on the white carpet wearing Alexander McQueen at the 2010 MTV Video Music Awards. Lady Gaga poses on the white carpet in an Alexander McQueen creation at the 2010 MTV Video Music Awards. Lady Gaga gives "Bad Romance" choreographer Laurie Ann Gibson a congratulatory kiss backstage at the 2010 MTV VMAs. Balancing act! Lady Gaga braves the stairs in her fierce Alexander McQueen shoes at the 2010 MTV Video Music Awards. Lady Gaga arrives at the 2010 MTV Video Music Awards wearing Alexander McQueen. Lady Gaga shows off her manicure along with her Moonman backstage at the 2010 MTV Video Music Awards. Lady Gaga backstage at the 2010 MTV Video Music Awards looking radiant fresh off her Best Female Moonman win. 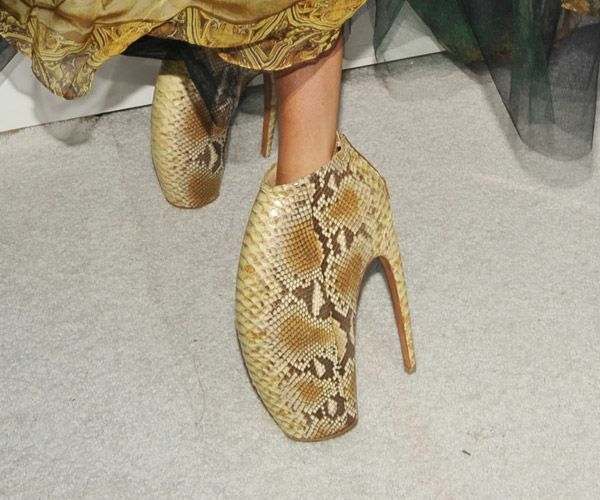 Lady Gaga's killer Alexander McQueen heels at the 2010 MTV Video Music Awards. Lady Gaga accepts one of her six wins of the night at the 2010 MTV Video Music Awards in Los Angeles. Lady Gaga backstage at the 2010 MTV Video Music Awards in Los Angeles. Lady Gaga gives her Best Pop Video Moonman acceptance speech dressed in black Armani at the 2010 MTV Video Music Awards. Lady Gaga accepts her Best Pop Video Moonman dressed in Armani at the 2010 MTV Video Music Awards. 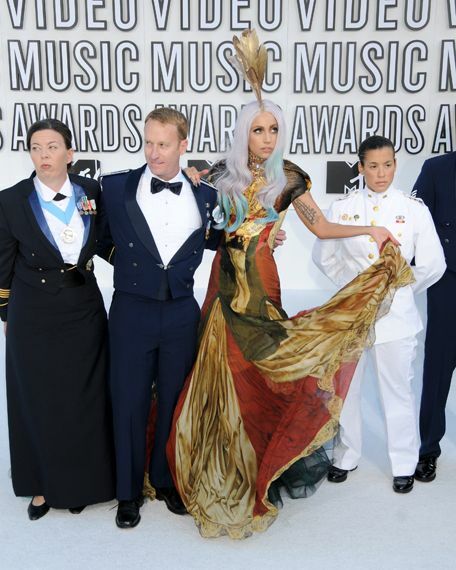 Lady Gaga exits the stage after accepting her Best Pop Video Moonman looking like an Armani draped Lady Liberty. Lady Gaga at her seat at the 2010 MTV Video Music Awards in Los Angeles. Lady Gaga and Jared Leto of 30 Seconds To Mars backstage at the 2010 MTV Video Music Awards. 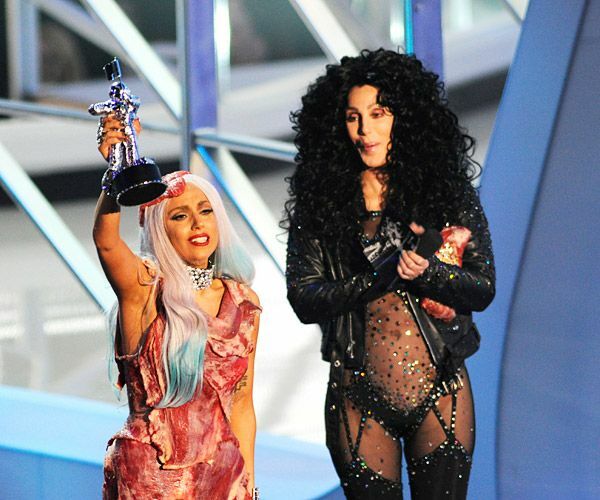 Lady Gaga, wearing a meat dress designed by Franc Fernandez, accepts the Video of the Year Award from Cher at the 2010 MTV Video Music Awards. Lady Gaga accepts the Video of the Year Award wearing a Franc Fernandez dress made of meat at the 2010 MTV Video Music Awards. Lady Gaga makes a statement in her Franc Fernandez meat dress as she accepts the Video of the Year Moonman at the 2010 MTV VMAs. 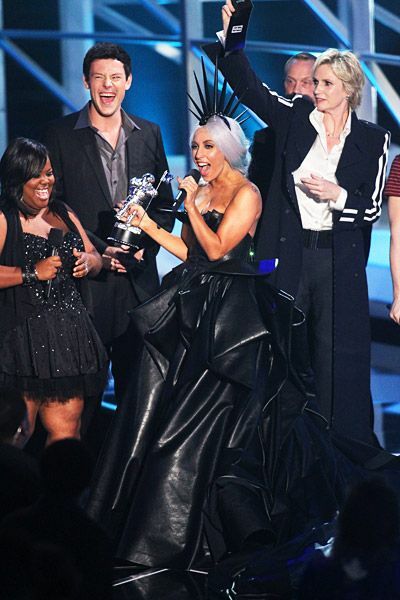 Lady Gaga hoists her Moonman high as she thanks the crowd for her award wearing meat dress while Cher looks on wearing big hair and little else at the 2010 MTV VMAs. Drake feigns taking a bite of Lady Gaga's meat purse at the 2010 MTV Video Music Awards. Lady Gaga shows off her Franc Fernandez designed meat dress and accessories at the 2010 MTV Video Music Awards. Lady Gaga blows a kiss in her meat dress at the 2010 MTV Video Music Awards. 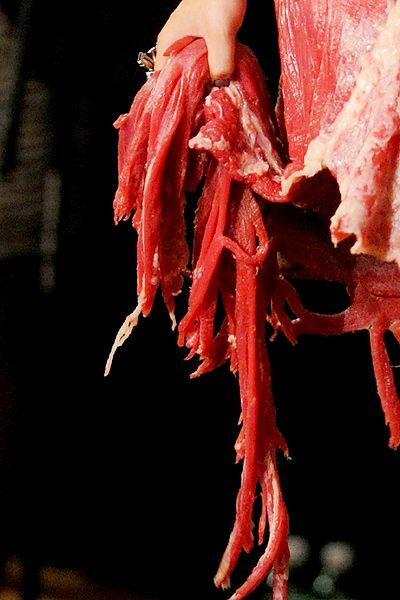 Lady Gaga poses backstage wearing a Franc Fernandez dress made of meat at the 2010 MTV Video Music Awards. It's a no pants party for Cher and Lady Gaga who don shocking 2010 MTV VMAs apparel: Cher in a barely-there catsuit and Gaga in a Franc Fernandez designed meat dress. Cher and Lady Gaga pose together in sheer and savory outfits, respectively, at the 2010 MTV VMAs. Cher and Lady Gaga cuddle backstage at the 2010 MTV Video Music Awards. Lady Gaga grips the hem of her Franc Fernandez designed meat dress at the 2010 MTV Video Music Awards. A close-up of Lady Gaga's rare shoes which complement her tartare-looking meat dress designed by Franc Fernandez for the 2010 MTV VMAs.